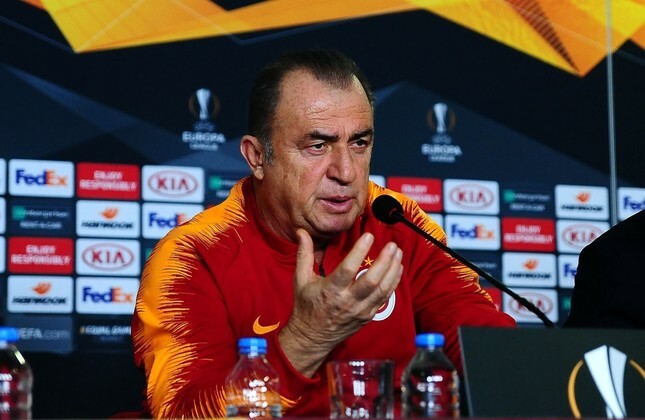 Fatih Terim speaks at a press conference in Istanbul, Feb.13, 2019. Terim relies on Diagne (right) and two new transfers in the starting 11 for a win against Benfica. Galatasaray, one of the two Turkish teams still battling on the European stage, will take on Benfica today in Istanbul in the first leg of the UEFA Europa League last Round of 32 matches. Veteran Turkish coach Fatih Terim was cautiously optimistic ahead of the match. He said Benfica is a difficult rival. Still, it can be the beginning of a new campaign in Europe for the Lions that once dominated international contests. The Lions started out in the UEFA Champions League this season but only finished third in their group. As a result, they were transferred to the Europa Leauge Round of 32. Benfica, like Galatasaray, finished third in its group, behind Bayern Munich and Ajax. Earlier in the Champions League Benfica had routed Turkey's Fenerbahçe and Greece's PAOK. Speaking at a press conference in Istanbul yesterday, Terim acknowledged the challenges Benfica posed, but he hoped to repeat their performance against Porto, another Portuguese outfit, in the Champions League. "Benfica is certainly better than Porto. They could even stay in the Champions League if not for unfortunate misses in the Ajax match. They are in top form," Terim said. He added that their target was naturally the Champions League but the lack of a forward and other challenges had dealt a blow to their ambitions. "Benfica is an important obstacle in our campaign. If we can win against them, it changes many things," he said. Galatasaray would count on new reinforcements to win the game, including Mbaye Diagne who was the top scorer in the Turkish Super League in the first half of the season before he switched to Lions from Kasımpaşa, another top-tier Turkish outfit. Greek forward Kostas Mitroglou, who also joined the Lions in January transfer window, will miss the game due to technicalities in his deal with Galatasaray, but Diagne and new defender Marcao and Christian Luyindama might at least stop a potential defeat. Benfica's injured players, including Jardel Vieira and Ljubomir Fejsa, were not included in the Portuguese side's starting 11 in Istanbul, along with aces like Grimaldo, Pizzi and Jonas. Terim says they also rely on the home advantage. "Whatever the result is, we want the fans to enjoy the game." Benfica is familiar with Turkish teams. It has played them 15 times in the past, but it has never enjoyed a victory in Turkey. Galatasaray was the only Turkish team to win a UEFA Cup in the 1999-2000 season. They also won the 2000 UEFA Super Cup. Benfica lost two Europa League finals in 2013 and 2014. Though the Lions are familiar with UEFA competitions where they played 277 matches, losses outweigh their 99 wins.